Earlier this year in this forum, Trevor Griffey argued that there’s a “class divide” between faculty in the United States over how to deal with the contingency crisis: tenured faculty grouping themselves around the flag of “de-professionalization” promote conversion of lines through open searches, while advocates for the non-tenured decry the “hyper-exploitation” of the system and promote automatic conversions of specific faculty to tenured positions. He points out that the structure of work has produced these distinct forms class consciousness within faculty at the same institutions and, in the case of community colleges in Washington state, within the same faculty unions. Viewed from across the national border from Washington state, in the Canadian province of British Columbia, aspects of how unionized faculty in community colleges working under the aegis of the Federation of Post-Secondary Educators (FPSE) of BC have attempted to deal with faculty contingency since the late 1980s may perhaps point out lines of sight and discussion based in faculty solidarity across rank that are not yet part of the American experience. There are many similarities between the BC and Washington institutions, including scope (the BC institutions with FPSE locals include colleges, teaching universities, and a polytechnic), size, nature of faculty and students, and types of programming (there are developmental, trades, university-transfer, and degree as well as certificate and diploma programs). Both Washington and BC are relatively prosperous—or, as we say in Canada, “have” jurisdictions. But the key difference between BC and Washington, and at least at the policy level for community college faculty unions in Canada and the United States more generally, appears to be that faculty unions such as those within FPSE have found a way to normalize the conversion of contingent faculty to “regular” faculty through collective bargaining. This conversion process has ensured that most community college faculty in BC will work as teachers at a reasonable wage until retirement. As a federation, FPSE does not itself negotiate how faculty are converted— its locals do. FPSE operates under the jurisdiction of the Societies Act. Its bylaws set out the terms of federation for 19 faculty unions who each operate under the BC Labour Code. The federation collects a standard portion of dues from each union, and from its central office provides staff and opportunities to assist with and support two major functions: contract administration and bargaining, along with policy development and lobbying. 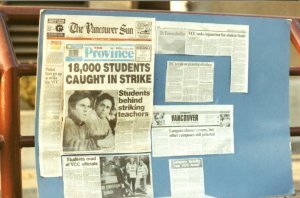 Each faculty union, or local of FPSE, has its own unique collective agreement and each has the final say on contract demands and ratification. On the issue of new faculty and how they become regular faculty, FPSE has worked since the late 1980s to encourage its unions to bargain conversion or regularization of the person (not just the line). This means that contingent faculty meeting certain requirements can expect to become a regular faculty member without a further posting or interview process. Being “regular” then means having the expectation and right to work until retirement. The situation is different within each of the 19 collective agreements. But over the years, the majority of local faculty unions have succeeded in bargaining conversion of the person provisions. This has resulted in an overall situation wherein the majority of work is done by regular faculty. The conversion system set out in the Vancouver Community College/ Vancouver Faculty Association Collective Agreement is the most automatic. There, if one maintains at least half-time status for 19 months out of any 24-month period, and has not received an unsatisfactory evaluation (the onus is on the College to have evaluations done in a timely way), one becomes regular the first of the month following, without further conditions. Salary is not an issue because there is only one salary schedule so it is not part of the conversion. It is already equal to that of a regular. A memo from HR simply goes out to all concerned. People are regularized at any applicable percentage between half and full-time. Being regular does not in itself protect one from layoff, but it provides a high degree of job security. If a layoff seems necessary, a full suite of layoff prevention mechanisms kick in: consultation with the union as to the cause and what alternatives might be available, political lobbying if appropriate, notice, transfer rights with portability of seniority, voluntary departure incentives offered to other senior faculty, automatic recall provisions, temporary recall rights, and if severance does occur, the right to severance pay. Unless there is proven cause for dismissal, there is no other layoff threat to a regular faculty member. Each of these provisions is actively enforced by the union’s steward/contract administration system. When all is said and done, layoffs are rare except when the government applies some misguided policy to an area of post-secondary education. During the qualifying period there is a need to protect the job security of non-regular faculty. Many FPSE locals have some form of “right of first refusal” to further work. In the VCC/ VCCFA Collective Agreement, this right, by seniority, kicks in after six cumulative months work at any time status. The effect of this provision is that a person who is approaching their regularization quota cannot be passed over when it comes to assignment of work within their area. Poster of historical events for the VCCFA, from the VCCFA galleries. There are several ancillary provisions that support this conversion system. All faculty at all institutions, no matter their status, have membership in the provincial government-union-employer-partnered pension plan and all have access to federally-administered unemployment insurance. As Americans know, Canadians have affordable access to basic medical insurance no matter their employment status. All FPSE unions seek to extend extended health coverage (prescription, glasses, other vision protection, physiotherapy, ambulance etc) to their qualifying non-regulars. Non-regulars can qualify for Professional Development time and funding. Further, in the VCCFA/VCC agreement there can be no overtime unless in an emergency, other agreements have overtime restrictions. In effect, at VCC, there is no added cost to regularizing someone. Unfortunately, there are still significant secondary salary scales within FPSE locals. These allow managements to cap wages for groups of non-regulars at less than pro-rata rates. This does not occur at every FPSE local. Some, like the VCCFA, have complete equity in pay, wherein one’s pay is determined by workload, not status. Working toward eliminating secondary scales is a focus for future bargaining amongst FPSE member unions and is certainly considered attainable. Nevertheless, what these provisions on a whole do is erase or reduce the financial incentives to treat people unfairly. They show that the cost of fairness does not have to be an issue. In the VCC situation where the total annual institutional budget is about $105m, the cost of salary and benefits for faculty is about $42m, or 40%. This may leave less for administrative expenditures, but so be it, because the institution is about teaching. VCC and the other institutions are not allowed to run budget deficits; they always have surpluses. One effect of the success of the FPSE bargaining for automatic conversion of contingent faculty is that there is not a faculty culture in BC community colleges that treats full-time and less than full-time work or faculty different. This kind of unequal status culture is not part of the union discussion in BC. All faculty at any time-status are expected to be participating members of their departments and the college. They can and do take part in shared governance. They can and do take part in research. They have enforceable academic freedom protections in the collective agreement from the first day they teach. Indeed, how can academic freedom be restricted to one group of faculty and not be there for another? People can make less than full-time work a rewarding career. They can be treated equally and paid equitably. Why wouldn’t they participate in and be committed to their institution, if they had the opportunity to do so? Frank…Hopefully this logical solution will be adaptable to our US labor laws and we will be able to move towards this more rational and just solution! Looking forward to hearing you speak at the CPFA 2018 Annual Conference at City College in San Diego on Saturday May 5th!